I got some fresh home-grown Okra (Lady’s Finger) from my aunt. I made a quick stir-fry with Lady’ Finger and it tasted yummy. Okra (Vendakka) is a sticky vegetable. You can remove the stickiness by applying besan (chick pea flour) or rice flour on the okra pieces. Some people recommend adding lemon juice or yogurt to remove the stickiness. Always use tender Lady’s Finger for cooking. If the Okra is not tender, it will be woody & fibrous. Wash the okra and slice it into round discs of 1/4″ thickness. Use a paper towel and rub away all moisture from the okra. Marinate it with all the above ingredients except oil. In a wide non stick pan, heat oil and add the onion & lady’s finger mixture. Keep on stir frying the okra on medium heat for around 10 minutes until it has lightly browned. Do not overcook the okra or it will lose its firmness. 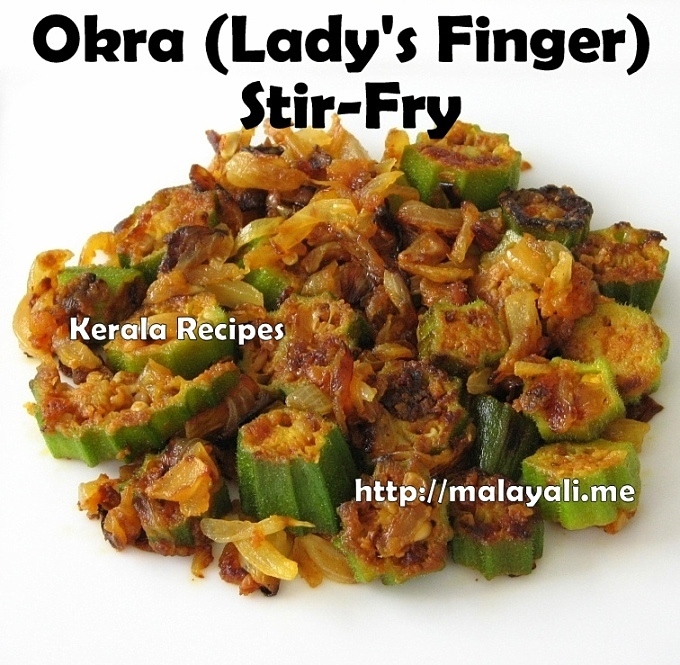 Serve this yummy lady’s finger stir-fry with rice.